Earlier last week, a video began to circulate on social media — a video which seemed to ignite every proverbial bonfire across the U.S. and the U.K. 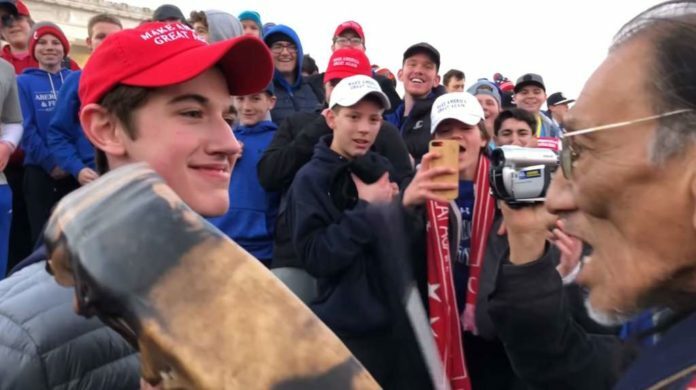 The video showed boys in MAGA hats mocking a Native American man while he sang and played a drum on the Lincoln Memorial steps in Washington D.C. One boy, in particular, appeared to severely mock the man by staring at him from a close distance in a sinister manner. As the video pinged around Twitter and Facebook, the reactions were predictably irate, with users describing the video as evidence of the country’s decline under Trump — evidence of the extreme, unabashed racism that has spread throughout the country, and evidence of the kinds of mis-education and disrespect that come from privilege. Some, of course, defended the boys, deploying quite shoddy-looking arguments about ‚free speech‘. It appeared cut and dry — the boys were Neo-Nazis in the making. They couldn’t see why a Native American playing a drum should be allowed to do that in the U.S.A. They shouted ‚build the wall‘ while standing next to him (in a tragically ironic turn). The boys were revealed to come from a privileged Catholic school in Covington, Kentucky. To compound the whole thing, they were attending an anti-choice, pro-life march, and appeared to mock the man while he attended the Indigenous People’s march. Social media and online outlets were ablaze with fury. How could this be happening in the U.S. in the 21st Century? While racist groups in the U.S. and U.K. defended the boys, without any semblance of a rational argument, stating that the boys were allowed to mock the man because they were white. It appeared that we had another international debate formed and shaped online: was America degenerating into a completely racist cesspit? And then, something happened. The video was discovered to be posted from a dubious Twitter account, one which seemed designed to create controversy by posting such videos. Other videos from different accounts appeared — ones which showed that a group from the Black Hebrew Israelites (regarded as a strange hate group by the Southern Poverty Law Centre) started the tensions. They called the Covington boys various insulting names, leading the boys to sing school songs in return. Nathan Phillips, seeing the tensions escalate, intervened between the two groups, singing and playing his drum, leading to the boys behaving as they did. Despite the fact that from the beginning Nathan Phillips had said this is exactly what had transpired, he was labelled online as a liar. The boys were vindicated, the extreme Black Hebrew Israelites were shown to be evidence of American decline under a too-strong social diversity — the boys had done nothing wrong, long live the U.S.A., Make America Great Again! Even the President waded into the furore with his big, muddy boots and clumsy writing style. And, breathe. Relax. So, what have we learnt? The media is completely geared towards extreme narratives, designed to generate extreme reactions. The machinery of these reactions (in the form of articles and social media posts) are very quick to develop narratives, which then generate reactions themselves. These narratives can take off without proper evidence and justification. The Black Hebrew Israelites are an extremely offensive group, the Covington Catholic boys are idiotic, and their response to Nathan Phillips‘ drumming was both racist and stupid. That being said, they are probably not Neo-Nazis in the making. Neither groups‘ behaviour is excusable. That being said, the boys did not start the confrontation. Nathan Phillips should have been listened to from the beginning as he never falsified or changed his story, and was shown to be in accordance with the second video. He never claimed to be attacked by the boys, rather, he intervened between two groups and was disrespected for doing so. The traditional narrative of white vs. black obscures very real stories and histories, such as indigenous peoples‘ ones. The speed and intensity of people’s reactions to the videos and stories, and the ‚largeness‘ of the conclusions they have drawn from them (that America is degenerating, that black people are the cause, and that Neo-Nazis are everywhere etc. ), for me at least, shows what strange, dangerous times we live in. It’s as though everybody has gone slightly insane, and at the mere flick of a switch, are ready to react. In this, I can only say I fear for peoples‘ health. Yes, the online world is an enraging one, but it’s important to take a step back and breathe, to think before we react. It’s also important not to get sucked into every ‚hot take‘ and reaction video. It’s important to wait and get the facts. It’s also simply very important to turn the computer off, to put the phone away and go outside. Let’s all calm down a bit. Look at the sky, listen to the birds. There, don’t you feel better? As its war on migrants intensifies, the U.S. government now cites environmental concerns to prosecute those aiding immigrants. The election of the first Native American Congress women went largely unnoticed. Current affairs give us a hint as to why. The recent elections in DR of Congo mark the first democratic transition of power since the country gained independence from Belgium in 1960. As political war over the border wall persists, the plight of detained migrants in U.S. custody worsens. Key events in 2018 defined how Africa impacts the world. The dynamics of the continent in 2019 may lead to a make or break.